I have found myself more surrounded than ever by the meaty carcasses of mammals everywhere. With hunting and fishing being very typical Alaskan activities, and given the harsh climate during the winter months, meat remains a big part of the diet here. It has been a few months since I became a full-on vegetarian (yay! ), so naturally any craving for meat has dissipated; but I have been making meals a tad more work for the family, moving me to almost give up the veggie route entirely and simply eat what has been put in front of me. However, my grandparents are very accommodating, and it seems I have dragged my dad onto the vegetarian train. My favorite part about traveling someplace new is grocery shopping. So much of what you find in a local grocery store or market tells you a lot about any given culture’s cuisine. When I visited Puerto Rico a few years back, milk was available in big plastic bags. In Barcelona, Spain, you buy your fish practically right off the boat. Only in Rhode Island would you find coffee milk (I don’t even know–Google that stuff). In an Alaskan grocery store, you get what you can find. This is especially relevant in the produce section, particularly because a lot of fruits and veggies have to be imported. Some days, there are awesome avocados; others, not so much. Also, produce is way more expensive than in the contiguous forty-eight states of the USA. Example: In the Northeast, organic bananas go for $.69 per pound, while ‘regular’ bananas are $.39 per pound. Here, banana prices start at $.89 per pound. Woah. Fortunately, there are plenty of fruits and veggies to go around, though never constantly available, and not always ripe. You get what you can find. On one shopping trip with my Grandma, we discovered kumquats while browsing the peppers in the produce section. Not entirely sure what to make of them, we went ahead and grabbed an handful. Later, after discovering their miniature, citrus-packed goodness, I incorporated them in a simple salad for dinner. Can I just say how much I enjoy stir-fries and salads? You literally chop up what you find, throw it together, and then ninety percent of the time, whatever you’ve made is awesome. 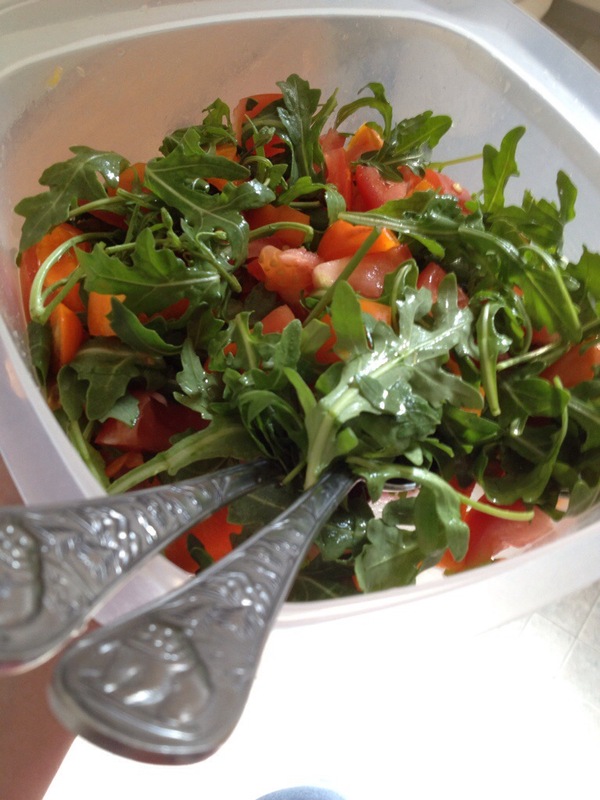 The kumquats, bursting with flavor, brightened up the entire look and taste of the salad. They have become on of my new favorite ingredients to work with! The best part: they are in season year-round, and one kumquat can go a long way. Posted 5 years ago by mgdailyexploits.